Having great Xmas, wish you were here! 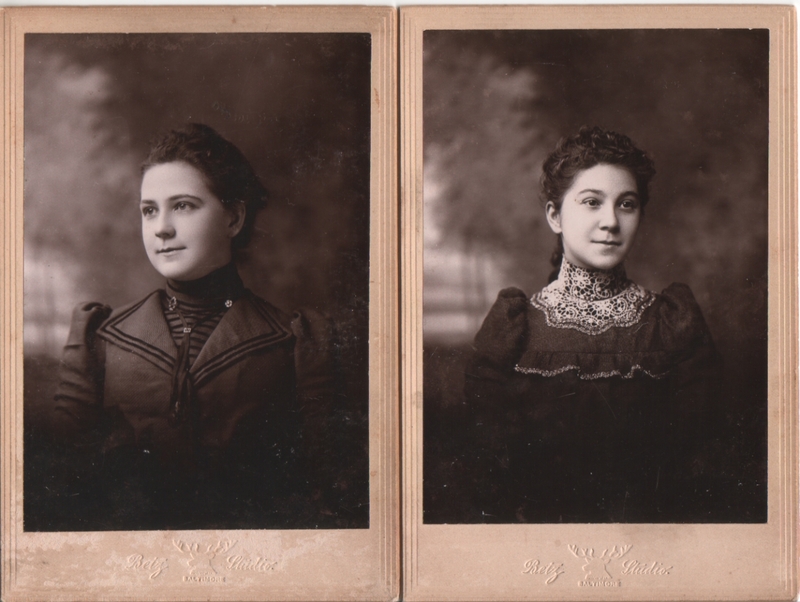 Two cabinet card-style photos measuring 4.5 x 6.75 inches each. Photographer is Betz Studio of Baltimore. Written on the backs of both in pencil is December 25, 1899. The handwriting on the backs is so similar that I assumed it was the same until I compared them, and now I believe they are not identical. The same is true of the girls pictured on the fronts. Until I put them side by side, I assumed they were the same person. I still assume they are sisters, possibly twins, but as always, without any hard evidence that’s just an educated guess. As with the photo I posted two days ago, I assume the date written on the back is an indication that these photos were presented as Christmas gifts, not that they were taken on Christmas Day, though I also assume they would be current photos taken not too long before. Incidentally, I’m not sure how well that sort of bolo tie thing on the left will show up in the final post, but it’s interesting to note that the clasp and both pins are all different. I think these are warm, flattering portraits. They look as though they were taken yesterday. Superb quality! That’s one of the reasons I like them, too. I have photos that have practically decomposed with time, so it always astonishes me to see photos like this where the image quality seems almost brand new. It’s such a window back in time that you sometimes have to remind yourself how far back you really are looking. I love the moose embossed logo.